The Ruhr Triennale is emphatically not just a theatre festival. 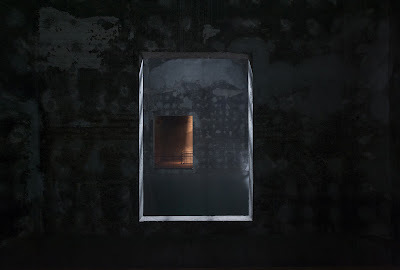 Indeed, on my visit, I didn’t see any of the pieces programmed under the “theatre” strand of the festival (Rimini Protokoll, Forced Entertainment, FC Bergmann, David Moss and, God help us all, the second part of Robert LePage’s unspeakable Playing Cards tetralogy). But, as it turned out, I was incredibly grateful for the stuff I was exposed to instead. I had a perfectly nice time in Edinburgh this year, but for some reason, I just didn’t get that excited about very much of the stuff I saw. Ironically, most of it was better than usual, but thanks to the combination of scratch previews (Yard, BAC, Forest Fringe at the Gate) and Festivals (Latitude, the Almeida, etc.) with already-secured transfers (Grounded to the Gate, The Events to the Young Vic, There Has Possibly Been an Incident to the Manchester Royal Exchange and Soho), it felt like a lot of what I ended up doing was just marking the fact of something’s presence, rather than any useful discovering. Ecologically speaking, not a vintage year. Ok, so I really loved my days spent at Forest Fringe at the end of the Festival too, but Forest Fringe having an excellent programme isn’t a surprise either. Ditto Northern Stage. 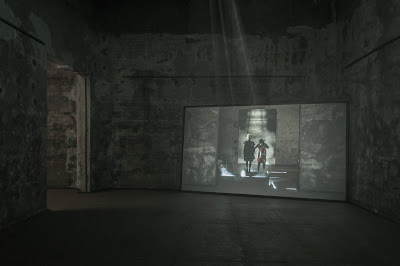 And what I happened to see of Summerhall actually felt pretty hit and miss. 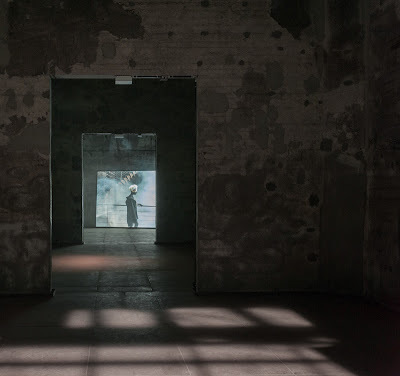 So, yes; it was with a profound sense of gratitude that I experienced Romania and the Ruhr Triennale: finally revivifying my critical compass in the way that I usually hope Edinburgh will. And I do wonder if part of the reason I found both trips so artistically invigorating was because none of the stuff that I saw that I loved was actually “theatre”. 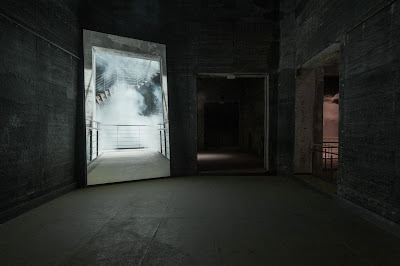 Scottish artist Douglas Gordon’s installation Silence, Exile, Deceit [yes, commas and caps] is set in another of the Ruhr’s astonishing spaces, the Mischanlage in Essen, part of the Zollverein former coal/coke plant. 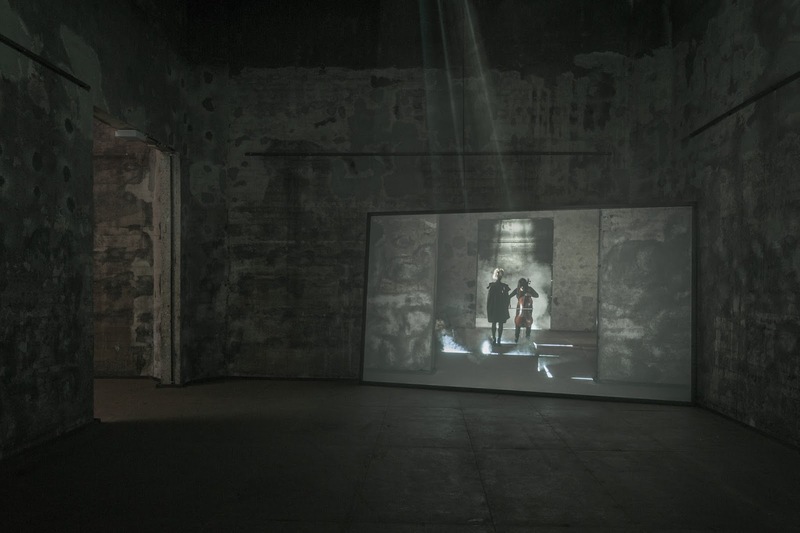 The Scottish artist – born Glasgow, living now, inevitably, in Berlin – says that he found much common ground between these abandoned industrial spaces in western Germany and the gutted manufacturing industry of his homeland. 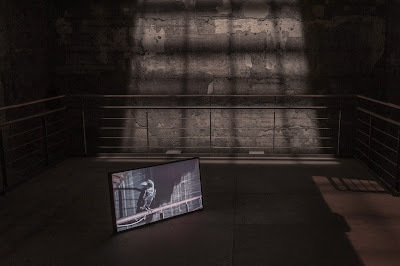 This is a theme to which I will return in my overview of the Triennale, because I think there is a world of difference between the atmosphere that surrounds the withdrawal from coal-mining and steel manufacture in Deutschland compared with the aggressive wholesale destruction of communities in Great Britain. 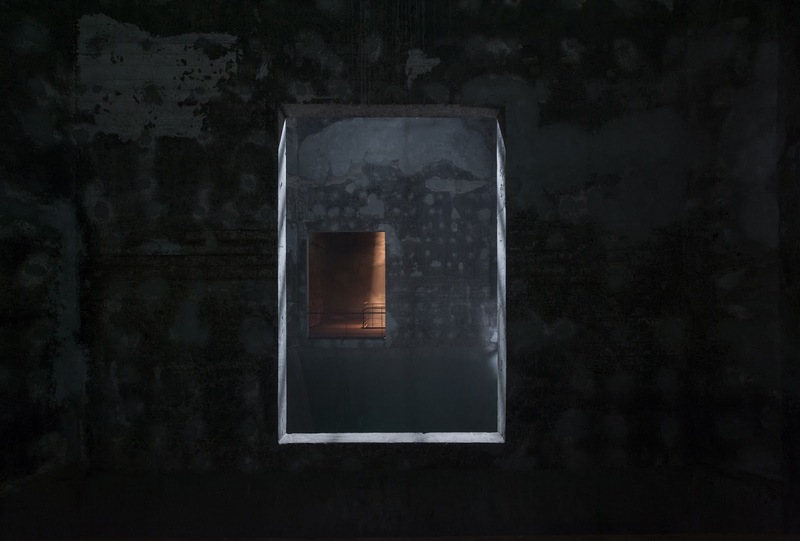 However, in simple aesthetic terms, an abandoned industrial building is an abandoned industrial building. And it is well within Gordon’s rights to appropriate its meaning as he sees fit. 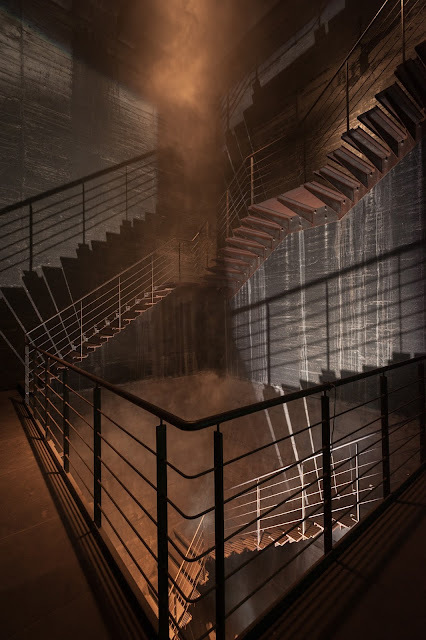 The installation he’s made basically takes place over one floor of this strange building in which coal, I think, used to be incinerate to make it into coke (as you see, I have no idea about industrial processes). You go up in a lift and enter via the floor above, where you can observe all the lights and equipment pointing down into the thing below. 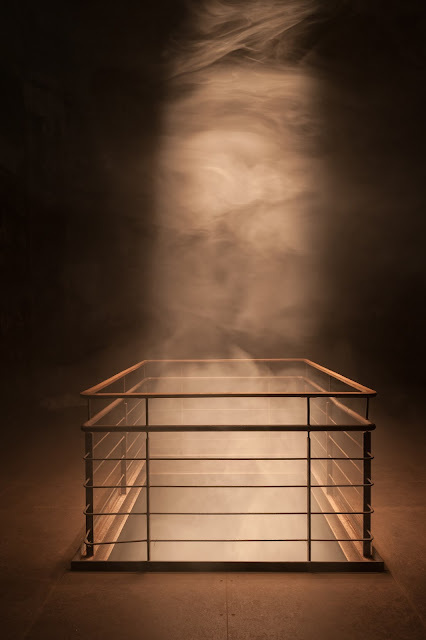 The installation itself is a mixture of lights, smoke machines, massive noise and video projections (and a stuffed dog lying apparently sleeping in the corner of one room). Really it is the building that is the star here, though. Like a concrete cross between Aliens and the tomb of a Pharaoh. In truth, my first impression was of a shoot-your-own Nine Inch Nails video (or maybe Wild Boys). 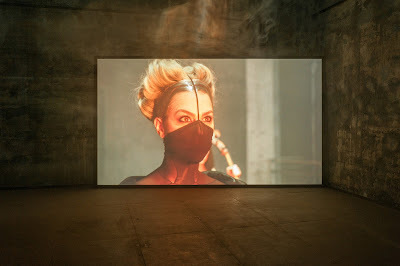 The video screens show plumes of fire suddenly bursting from the pits at the centre of the rooms you’re walking through, while elsewhere on another screen, a soprano and cellist, dressed in costumes suggesting refugees from Matthew Barney’s Cremaster cycle, fill the air with eerie howls and screams, along with bass booms of ghostly industrial machinery. Watching as a theatre-person, one is most immediately taken with the idea of the space as a set. And then, by extension, seduced by the idea that “a set”, or “a space”, can be the entire work of art, without any need for live performers moving around and (in the case of theatre, more than contemporary dance or opera,) having to say a bunch of words as well. That said, given this space’s medium size, there is only so much time you can really spend wandering around here before you think you’ve pretty much seen it all, although the amount of video footage there actually is remained a mystery to me. 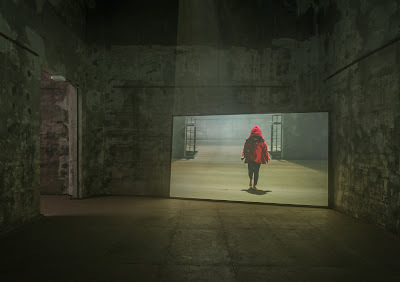 At one point, a small child in a red coat runs through the space (in the video), putting me in mind of the film Don’t Look Now, as impression augmented by the darkened corridors and smoke-filled shafts of light. It is only when someone explains that the stuffed sleeping dog in the corner of one of the rooms is in fact a wolf that a whole new avenue of interpretation opens up. How the Little Red Riding Hood story connects up to the title Silence, Deceit, Exile is a matter of interpretation, and how either connect to the strand of meaning about a lost industrial past or a dispossessed working class, is further fertile ground for digging. As I said, re: Die bitteren Tränen der Petra von Kant, I’ve got newly interesting in the extent to which British criticism (not least because of it’s overnight imperatives), appears to really want every meaning to be immediately available and flagged-up. Like comprehension should be instantaneous or not at all. Or, rather, if comprehension isn’t instantaneous for the critic, if a real revelation comes some days after seeing a piece, then the damage of that realisation not coming faster will have already been committed to print and star-rating. It’s not a relationship that any other theatre-goer need have to theatre, and so it feels problematic that it is a relationship that exists between a piece and the people who should in theory be understanding it and appreciating it best – the critics. At the same time, I worry that (“mainstream”) British Theatre, with it’s often all too-readily flagged-up messages, intents and meanings has dulled my wits slightly. Made me a bit used to being able to watch theatre half asleep with a head full of cotton wool and still get the take-out message that an intelligent child could readily apprehend. Thinking about it further, I started to think about the space in relation to what I saw in things like Sebastian Nübling’s production of Pornographie – that sense of a physical world, a set which was it’s own complete, discreet story. Art work of art in its own right which also tells the same story as the “text”, but is also a part of the bigger picture. And I was reminded of something that one of the people from the Goethe Institut who had effectively sent me here had said when we first met at a theatre, which was that she sometimes missed the “that extra visual dimension” of German theatre. None of this is to beat up on the British. I think we’re getting better at doing this stuff the whole time, but standing inside this art installation I think I realised a few things about theatre which I’d not necessarily articulated to myself before. Post cards are indeed very important for the expression of our thoughts.